While the majority would surely agree that two people doing the same job should be paid the same salary, the reality is unfortunately somewhat different. Around the world, there is no country where women earn an equal salary to that of their male counterparts, a study by the United Nations population fund found. A 2017 study from the Central Statistics Office which polled gross hourly earnings showed that women in Ireland were paid on average 14% less than men. This was compared to a 12% gender disparity in 2012, highlighting the increasing pay gap between the sexes. The most recent census in Ireland which was completed in 2016 revealed that 98% of those who stated they were responsible for looking after their family and home were women, with only 9,200 of the 2.3 million men living in the country stating they were responsible for their home and/or family. While this figure has increased since 2006 – when the findings of the census revealed that only 4,900 men were responsible for their home or family – there is still some considerable progress to be made to reach a state of gender equality. While there appears to be a defined – and increasing – gap between the pay of men and women in the workplace in Ireland, we may need to look to those who have just graduated to identify where the discrepancy originates. The 2016 census found that male graduates were dominating the traditionally higher paid industries of engineering, communication, manufacturing and construction, whereas female graduates were more prevalent in industries including welfare, education and healthcare. We may also need to look even further back than graduates, with school subjects impacting the future careers that women enter. The focus of traditionally male-dominated subjects such as science, technology, engineering and maths – often referred to as ‘STEM’ – should be geared towards girls as well as boys during school years. A diverse, balanced workforce encourages innovation and growth, yet the imbalance between the genders is clear. While women in the workplace often choose to work in industries with lower pay such as healthcare and charities – or they have familial or care-giving responsibilities – there are other factors which contribute to a gender pay gap, such as social pressures and, many believe, an innate gender bias. It is suggested that women are often placed at a disadvantage in subtle ways in the workplace, such as through the prevalence of the 24/7 working culture where employees are expected to be ‘switched on’ and accessible outside traditional office hours. This workplace culture is believed to contribute substantially to inequalities in the workplace, as those who have care-giving responsibilities outside their place of work – primarily women as the census statistics revealed – are often unable to work in this way. The need for women to take time out of the workplace when they have children is also a primary contributing factor to women earning less than their male counterparts. Once they have had children, women often prioritise raising their family above working full time. Many choose to work part time, or may cease to work completely to dedicate their time to raising their family. Part time work or reduced hours often has a negative impact on a woman’s career prospects, as opportunities for pay rises and promotions are often less prevalent than those for men. Indeed, women are often paid less for the same role from the outset, putting them at an immediate disadvantage. While male dominated industries are often seen as ‘boys’ clubs’ and the IT industry is often perceived to be heavily male focused, the industry is also regarded as one of the most innovative, so the sector as a whole must do more to ensure there is a culture where women can thrive. The technology industry is admired for being such an innovative industry, yet it must do more to institute a culture where women can progress – from entry level roles through to the most senior positions. Overall, women are currently considerably under-represented in senior positions across the EU, with only 17% of board members in the largest listed companies registered as female. Women also only account for ⅓ of engineers and scientists in Europe. How can the gender pay gap be addressed? While addressing – and closing – the gender pay gap is key for an equal, balanced workplace, it is also a primary factor in achieving employee wellbeing and job satisfaction, as the OECD (Organisation for Economic Co-Operation and Development) found. How is Ireland addressing the gender pay gap? The Irish government hosted a symposium in January which addressed the country’s gender equality agenda. 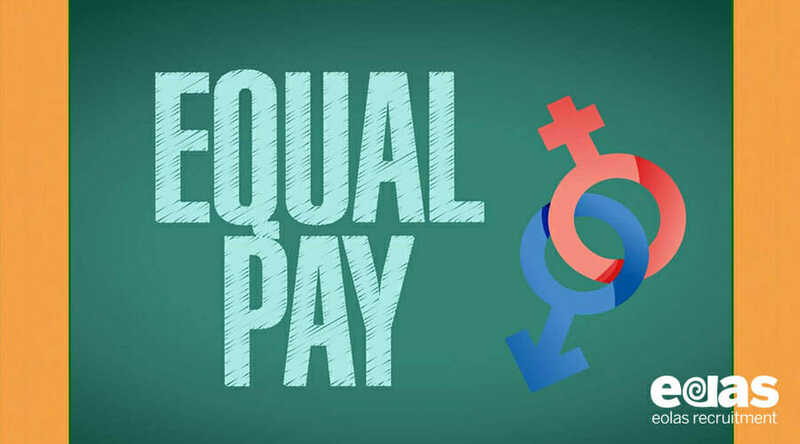 Requirements for companies to publish their employees’ pay were discussed, alongside other measures to address the pay disparity between the genders. The aim of the strategy is to build ‘…an Ireland where all women can enjoy equality with men and achieve their full potential, while enjoying a safe and fulfilling life’. The Connecting Women in Technology conference held in September 2017 discussed the role of women in technology, with a focus on inclusion and promotion. 18 of the top tech companies in Ireland – including Google, BT and Hewlett Packard – shared ideas on how to recruit and retain female employees in the traditionally male dominated industry. The signs are promising, as while current EU figures show that while women in Ireland currently earn 14% less than men on average, this is less than the UK where the gender pay gap currently sits at 19.5%. At Eolas Recruitment, we welcome the progressions towards continuing to address the gender pay gap and wholly support the equal inclusion of women in the technology, IT and communication sectors. Whether you are looking for your first role in the industry, or you are established in your career, get in touch with us to discuss your recruitment needs.